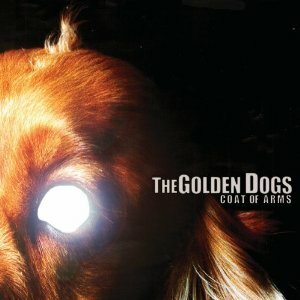 The Golden Dogs’ forthcoming album, Coat of Arms, is a collection of unique and interestingly textured releases. Each song on the album seems to be a unique emanation of its own as opposed to a bunch of songs that sound alike thrown together onto one disc. “As Long as You Like,” is light-hearted and playful pop, whereas “Darkroom” is moodier and driven, with a strong classic rock feel. “Cheap Umbrellas” is a brilliant collision of psychedelic rock foundation with a modern indie vocals and chorus. The textural musings of both male and female vocals compliment and contrast each other, like a great conversation from an interesting couple. The band consists of lead songwriter, Dave Azzolini, who is supported by Jessica Grassia (keyboards, vocals, and percussion) and Taylor Knox on drums. About half of the songs are led by Grassia’s sweet and delicate vocals; the tracks featuring both Azzolini and Grassia are a fantastic and almost serene marriage of psychadelic rock and indie pop. This is the bands sixth release and third full-length album and is set to drop on April 26th. Favorite- “Underwater Goldmine” is a dreamy anthem for a slow spring afternoon with a French pop flare.